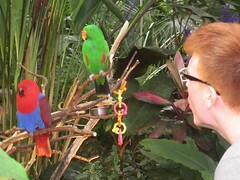 About one and a half week ago I went on a little trip together with Iris and Merle. Although it was only a two-day trip, it felt like I’ve been away for at least a week and our time there was great! So where did we go? Well a few weeks ago I wrote how great my first surf experience was and I totally fell in love with it, so I decided to do it again: destination Tofino. I was lucky that Iris and Merle also wanted to have this experience and we were able to go together. 24th of June, 6 AM: I was standing at the bus stop with only three hours of sleep and a little hungover from my barbecue party the night before. Once I saw the girls and our tour bus from Discover Canada Tours, I felt kind of alive again and I was good to go. According to our fantastic tour guide we had a full day of planning on our way to Tofino. So we took the ferry to Nanaimo, drove to Tofino and made a few stops in between. We saw some big trees and a beautiful spot along the river. Good thing; it was super warm and shiny weather, bad thing; our air-conditioning didn’t work. Sweaty kids in the back of the bus, but still laughing our asses of from all the stupid jokes that came from our overheated brains. Besides that I must say our tour guide did a great job with keeping us entertained by covering Lady gaga, Adele and even Queen. Along with great dance moves we were very amused. When we arrived in Tofino, we had free time and I showed the girls around the city (actually only two streets since Tofino is not that big). Of course I ended up at a boutique buying some vintage clothes while I really promised myself I was not going to buy any clothes that month, whoops. After that we went to a sushi restaurant that had an amazing view over the inner harbour. Unfortunately the sushi was not that great, but the company and the view made it a good experience. Our tour guide picked us up and brought us to the hotel. We took a quick shower since we were melting away in the bus the entire day, and made ourselves ready for the campfire on the beach. I still can’t really believe this since there were quite some guys on the trip, but I lit the campfire (yay me). Here we finally got the chance to meet the others from the bus and we had some really nice conversations. We enjoyed the amazing sunset and the fire went on for hours. This really is one of my favourite nights in Canada because Tofino kind of became my happy place. We had good company and a stunning sunset, what do you want more? The next day, after three hours of sleep again, it was time for our surf lesson. Surf Sister gave the lesson and in my opinion they did an amazing job. First they explained a lot about the ocean and how it works with surfing and then, after some practise on the beach, we took our boards into the water. I could really feel my previous lesson helped me since standing up became easier. In the end I even did a 180! Because it takes a lot of energy we went lunching in town afterwards, together with our new friend from the bus. With full stomachs we took the Tonquin trail to Tonquin Beach, hoping to spot wales. Unfortunately we didn’t see any, but we did see Eagles flying in a scenic view. We had a great time chilling there and before we knew, it was time to get back to the bus and head to Nanaimo. Sweaty kids in the back of the bus again, I guess it was even worse then the day before, but we made our way to Nanaimo. On the ferry we were able to enjoy the sunset and we went on a little whale hunt again. I guess we weren’t very lucky with the whales that weekend, since we didn’t see them around. We saw a dolphin though, which was really cool too! Back at Canada Place we said our goodbyes and we all went home. The days after were pretty hectic since I met up with people from the trip, which was really fun! Now everybody is back to their daily routine, but the trip will remain a great memory. This Saturday, September 20th, we’re going to visit the Queen Elizabeth Park. The Park is placed at the geographical center of Vancouver. 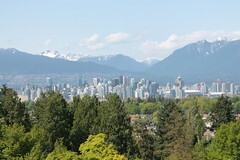 Since the Queen Elizabeth Park is the highest point in Vancouver you can catch amazing views over the city. And of course the park has many beautiful gardens to walk through and enjoy. Some of the larger trees are about 60 years old. The coast redwood can grow to be one of the tallest trees of the world. You’re able to do different activities there. So you can play Pitch& Putt, Tennis, Golf, Roller hockey, basketball, disc golf and lawn bowling. For sure it’s also fun just to watch other people playing, to relax and hopefully to enjoy the sun. If there is anybody of you, who has a Frisbee, please take it with you, so we’re able to play Frisbee on the free Frisbee area. This would be a lot of fun. If we’re getting hungry, we have the opportunity to have a picnic or to visit the Park Restaurant, which serves great food with an amazing view. 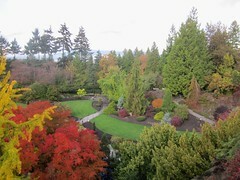 The Queen Elizabeth Park is sure to be one of the highlights of any visit to Vancouver. The Park is near Oakridge-41st station on the Canada Line. We’ll meet at the entrance along West 37th Avenue between Columbia and Mackie streets at 4 pm. Click here to get the way from the station to the entrance. So let’s meet up for a fun day at the Queen Elizabeth Park. INTERNeX Canada: What to do on the weekend. One Thursday more…and one weekend more is coming ! Let’s talk about some interesting activities for you. 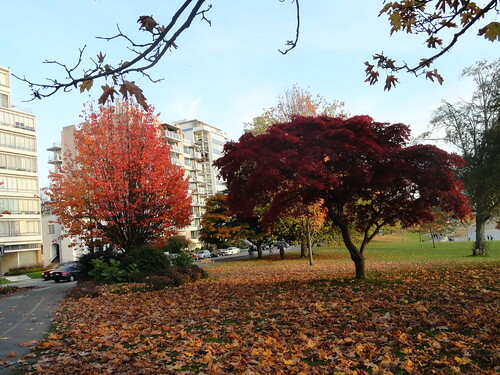 This Saturday, we are going to Queen Elizabeth Park, located at the geographic centre of Vancouver, at the junction of Cambie Street and West 33rd Avenue. Full of colors and different flowers,this 52 hectare park is one of the most beautifully maintained public parks in the world. Second only to Stanley Park in annual visits, it receives nearly six-million people a year. Dancing Waters: the famous fountain is comprised of 70 jets of water using 85,000 litres of recirculating water. Arboretum: Canada’s first civic arboretum. The first plantings were done in 1949. The larger trees are about 60 years old. 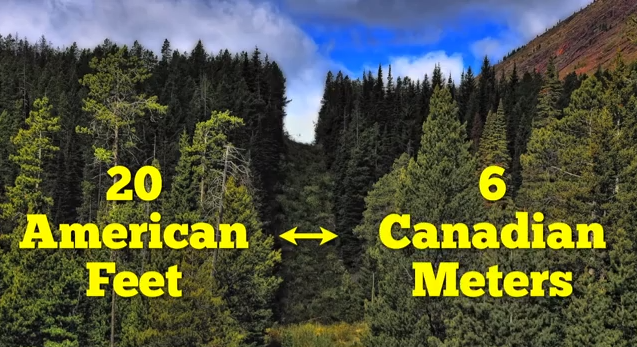 Among these is the coast redwood, which can grow to be one of the tallest trees in the world. Rose Garden:was built in 1967 to commemorate Canada’s Centennial. It contains many rose varieties. Sculptures: The park’s most famous is Knife Edge-Two Piece by Henry Moore. There are also four sculptures by Cameron Kerr in the plaza. This is just some of the things we can do in Elizabeth Park, in Vancouver. You can also play tennis, basketball, rolley hockey and much more. I hope you come with us. Join us in our Facebook event ! This week I would like to share a picture that I took during my amazing trip to Sun Peaks. I took this picture on the top of the mountain where one of my favorite runs, the 5 mile starts. This run was amazing, I did it a couple of times! It was amazing to see all the snow on the trees, just so beautiful! On February 17th till 19th we are going to Sun peaks and you can join us! check out our the official event on our Facebook page! It was a beautiful weekend in Vancouver, the sun was shining, the sky was blue, and the trees are yellow, orange, and red! 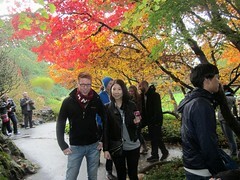 It was a great weekend to go and enjoy the fall in the city of Vancouver! On Saturday I went to Stanley Park, English Bay, and Second Beach. I saw many racoons in Stanley Park. On Sunday I went to Vanier Park, the view from this park is great! you can see Stanley park, and the beautiful skyline of Vancouver Downtown. Fall is one of my favorite seasons, but very soon the winter will start, and I cannot wait! 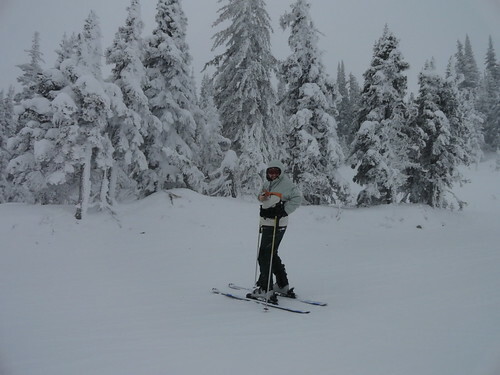 In Vancouver are many possibilities to go snowboarding! For example Grouse Mountain, Seymour Mountain, and Cypress Mountain! How was your weekend? let us know! by sending an e-mail to pr@internexcanada.com! The writer of the best story wins a price, and the story will be posted in the ‘How was your weekend’ blog! Join in on an invigorating yoga session 6p.m. 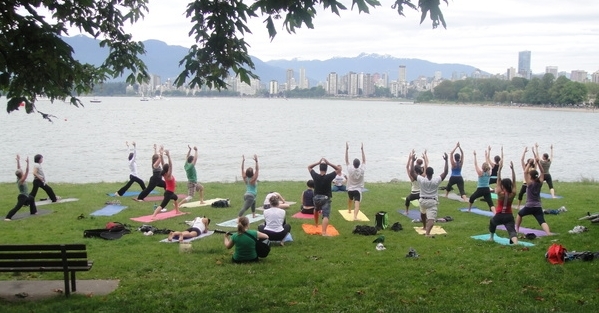 on Wednesdays at Kitsilano Beach – between the Yacht club and the Pool – overlooking the ocean. Bring your mat for an hour of intention and fun! Stretch and relax under the big blue sky, overlooking the abundance of sea, surf, boats, yachts, people & trees. Music, yoga, kula, friends, happiness, abundance…be a part of this wonderful experience! This session is Karma yoga by donation, supporting local charities. This means there is no admission price but a donation is greatly appreciated. Bring your mat for an hour of intention and fun. All levels are welcome so if you’re a first timer, don’t worry!